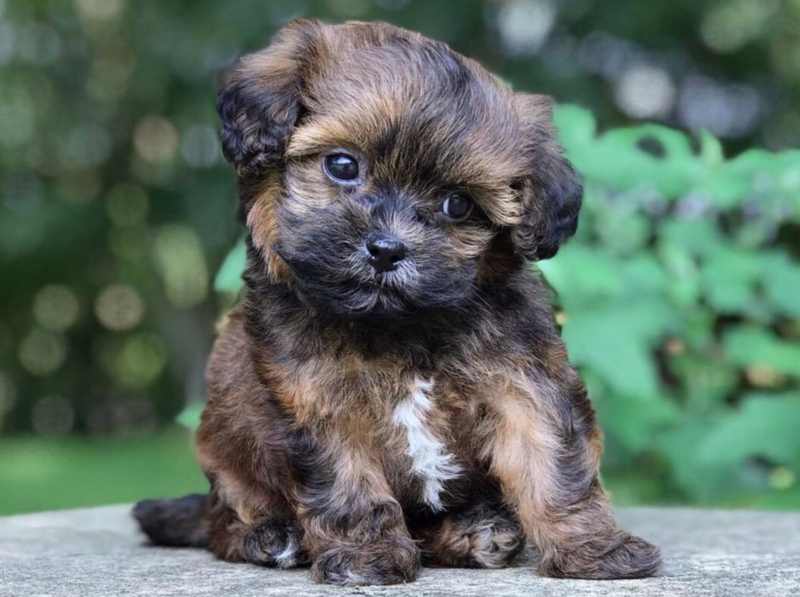 Shih-Poos are very sweet and laid back dogs. They have an adorable smushed in nose and short little legs. 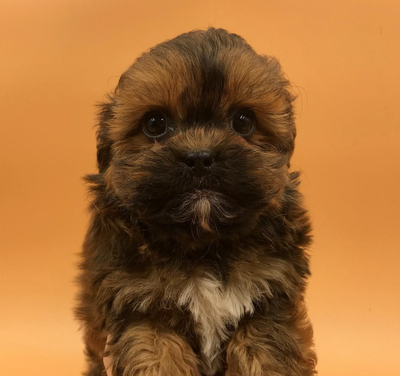 The Shih- poos often look like little teddy bears. 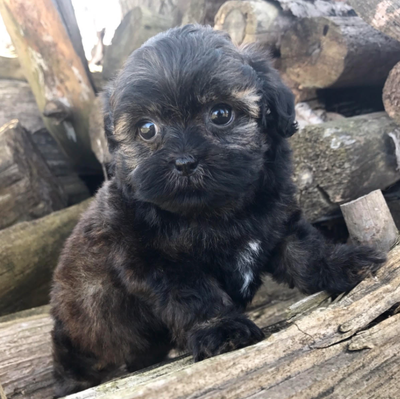 Oreo was born on February 25th and will be able to go to her new home around April 22nd. At 6 weeks of age when these pictures were taken on April 9th, she weighed 2 lbs 12 oz. 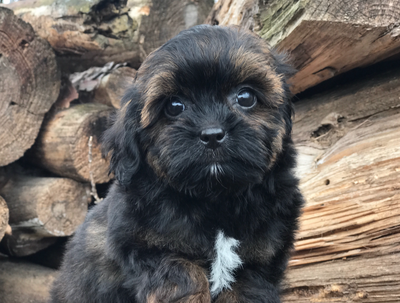 We expect Oreo to be around 9- 10 lbs full grown. Oreo is mostly black in color with white markings. She has white mittens on 3 of her paws, white on her nose, chin, and head. Mom: Holly, 10 lb white and tan Shih- Tzu. Dad: Charles II, 11 lb dark red small miniature poodle. 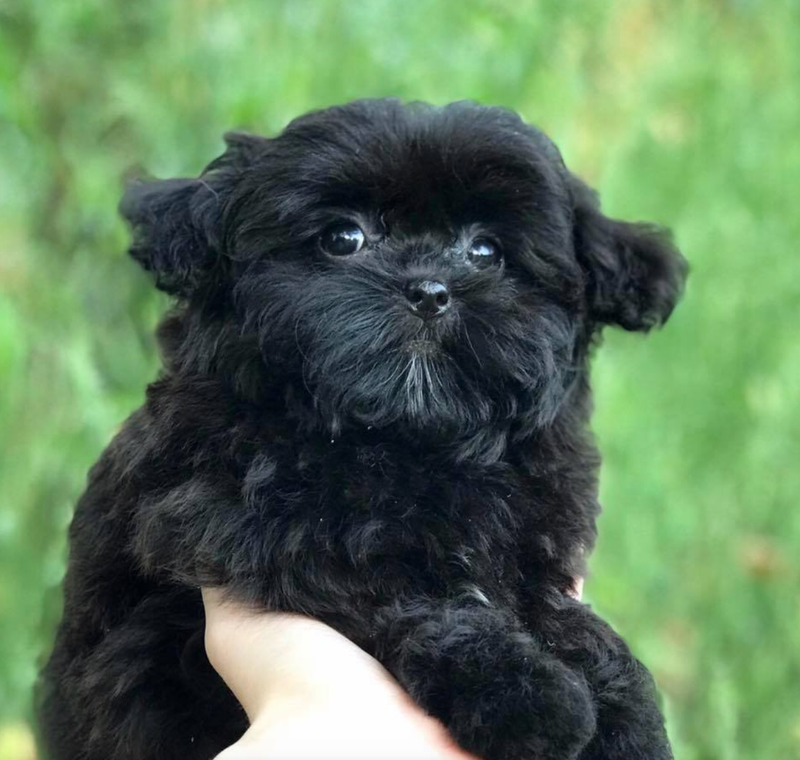 Blackie was born on February 25th and will be able to go to her new home around April 22nd so long as she's 2 lbs in weight. At about 6.5 weeks of age when these pictures were taken on April 14th, she weighed 1 lb 10 oz. We expect Blackie to be around 6.5- 7.75 lbs full grown. Blackie is mainly black in color with white on her chin and chest. She's also starting to gain chocolate coloring by her ears and on her back. Bugsy was born on March 30th and will be able to go to her new home around May 25th so long as she's 2 lbs in weight. At about 2 weeks of age when these pictures were taken on April 14th, she weighed 1 lb 1 oz. We expect Bugsy to be around 7 lbs full grown. Bugsy is mostly black in color although she has a tiny bit of white on her chin and white markings on all her toes. Selection occurs at 6 weeks of age around May 11th when personalities more prominent. Microchip #: Not yet microchipped. 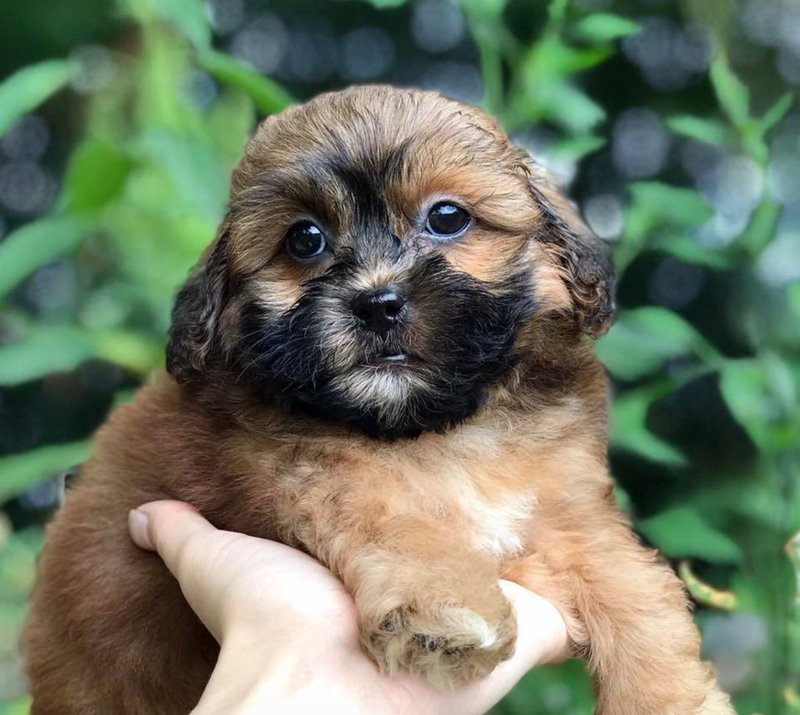 She will be microchipped around 5 weeks of age. Maisie was born on March 30th and will be able to go to her new home around May 25th so long as she's 2 lbs in weight. At about 2 weeks of age when these pictures were taken on April 14th, she weighed 13 oz. 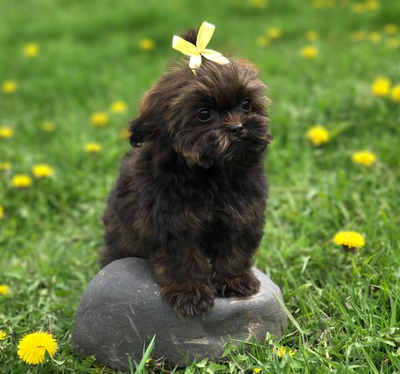 We expect Maisieto be around 5.75- 6 lbs full grown. Maisie is mainly black in color although she has white mittens and a teenie bit of white on her chin. Freckles was born on January 29th and will be able to go to his new home on March 26th. At about 7.5 weeks of age when these pictures were taken on March 23rd, he weighed 2 lbs 5 oz. 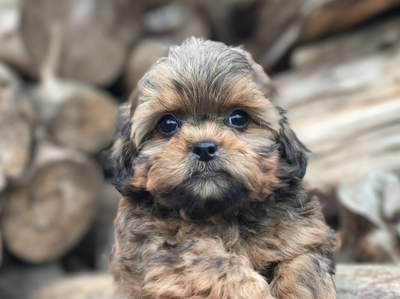 At this age, we expect that he'll be around 8-9 lbs full grown. Freckles is white with black spots. Freckles has the sweetest puppy- dog eyes and a smushed nose. 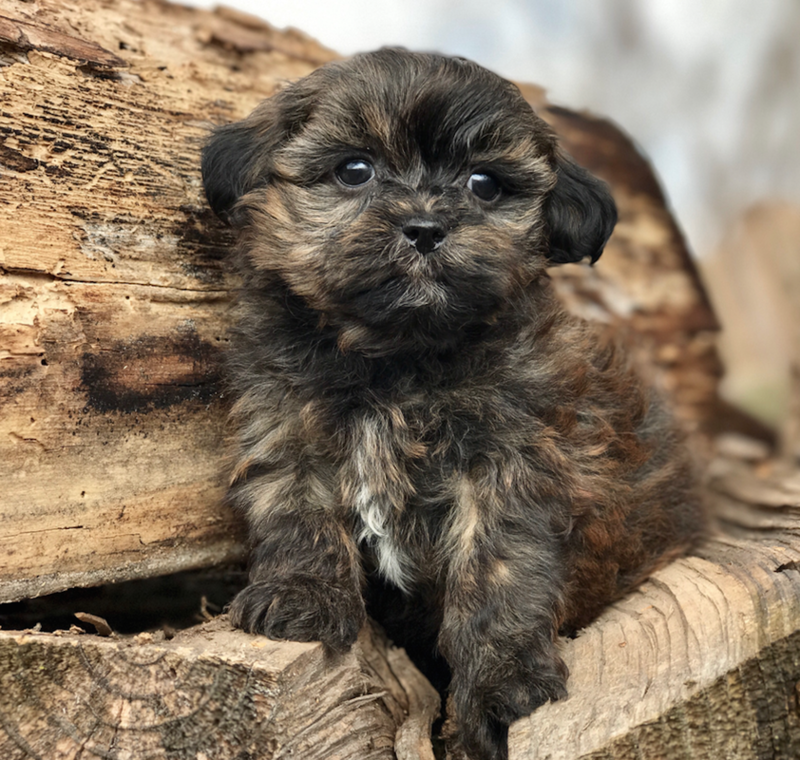 Purebred Shih- tzus will be low to non- shedding. They're also a very snuggly breed and make for a great lap dog. 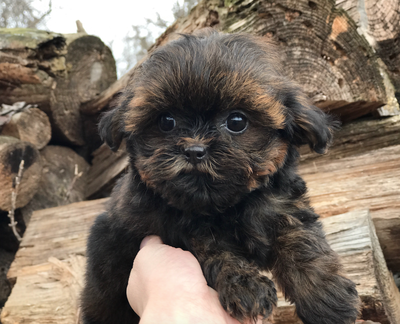 Fergus was born on March 30th and will be able to go to his new home around May 25th so long as he's 2 lbs in weight. At about 2 weeks of age when these pictures were taken on April 14th, he weighed 14.5 oz. At this age, Fergus is charting around 6.5 lbs full grown. Fergus is mostly black in color with white on his upper lip, chin, and paws. Microchip #: Not yet microchipped. 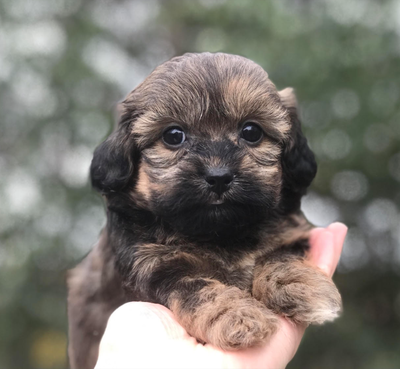 He will be microchipped around 5 weeks of age. Louie was born on March 30th and will be able to go to his new home around May 25th so long as he's 2 lbs in weight. At about 2 weeks of age when these pictures were taken on April 14th, he weighed 15.2 oz. At this age, Louie is charting around 6.5- 7 lbs full grown. Louie is mostly black in color with white on his chin, paws, and upper lip. Are you ready for some action, Shih-Poo style? 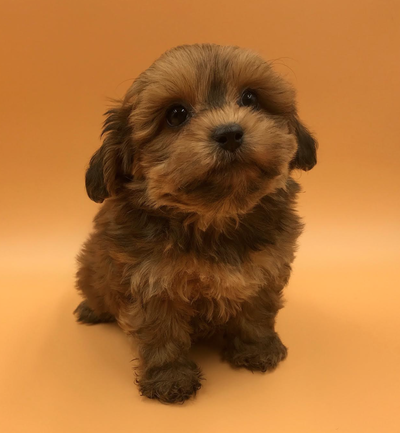 The Shih-Poo (also known as a Shoodle) is a fun-loving and energetic little designer dog. His zest for life is intoxicating. 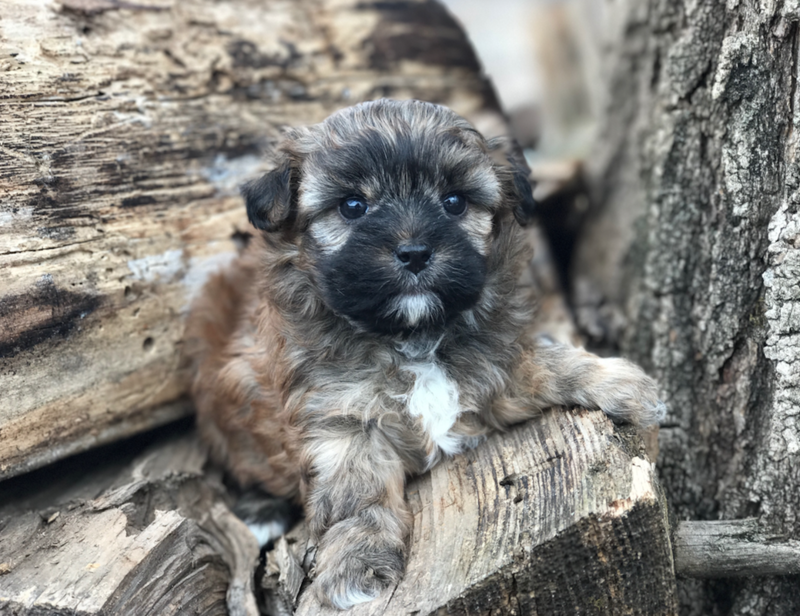 A mix of Shih Tzu and Toy Poodle, he’ll have everyone in the family running around, chasing a ball alongside of him. Although he doesn’t need loads of exercise, he is spunky when he wants to play. 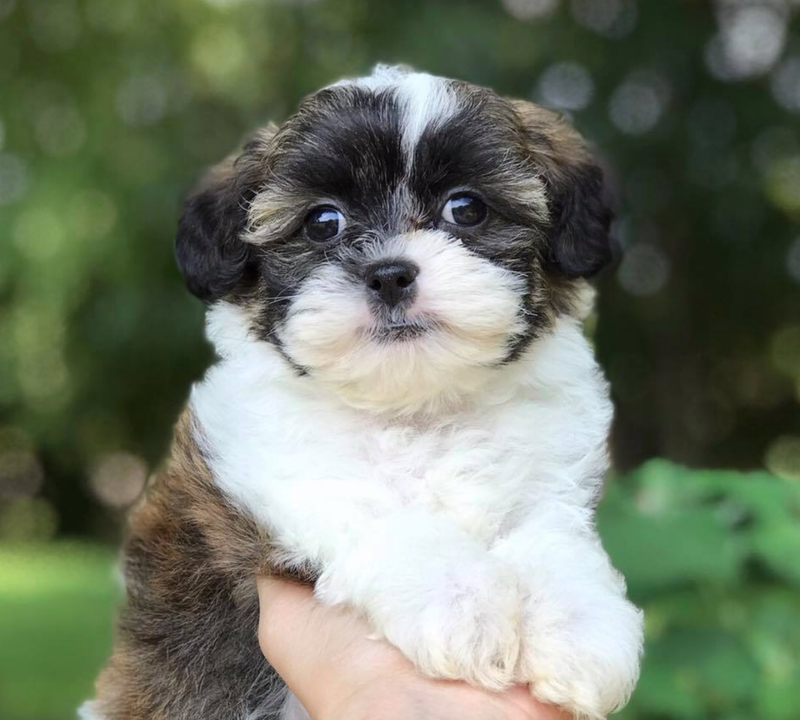 Shih-Poos will race around the house or run around the yard; it doesn’t matter much to him. This crossbreed is a great companion for families who live in small apartments or have large backyards in the suburbs. He’s quite adaptable to a variety of living situations. Shih-Poos are playful and energetic dogs. They love to chase after balls, play with squeaky toys or drag stuffed animals around the house with them. Shih-Poos’ coats can be long and silky or short and curly or even somewhere in between. Colors are as various as those in the rainbow. 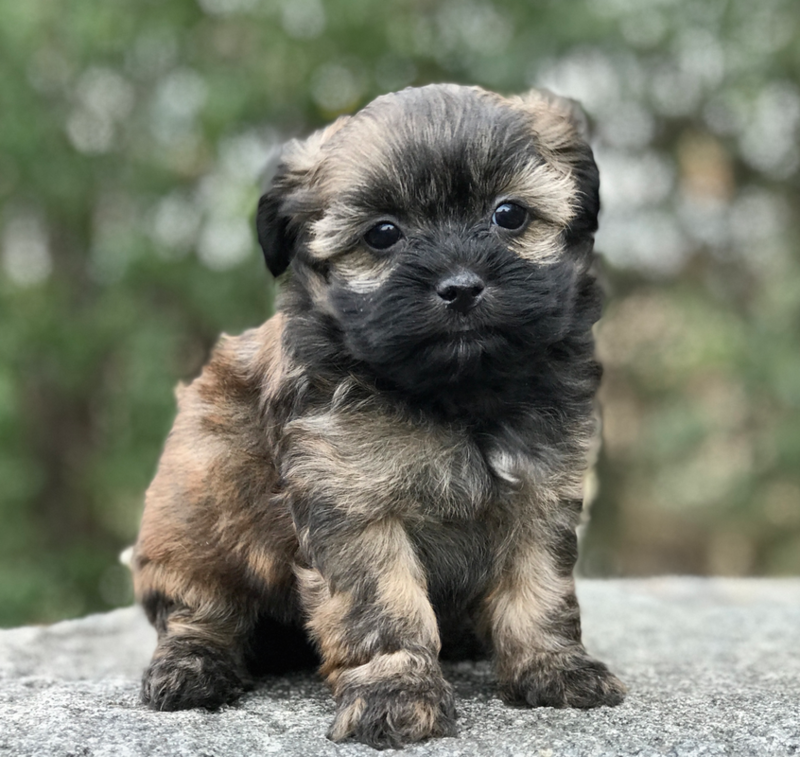 Major differences in coat style and color can occur within the same litter of Shih-Poo puppies. Brushing is essential and should be done at least twice weekly. The Shih-Poo’s coat might need seasonal trimming; it all depends upon the type of coat the particular dog has. 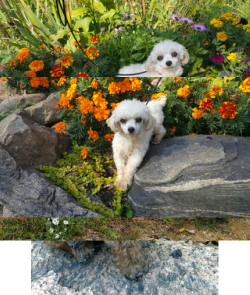 Pictures below are previous Shih-Poos.